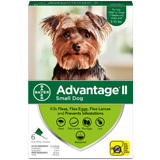 Advantage flea control stops fleas from biting in 3-5 minutes, kills 98-100% of fleas within 12 hours of application and kills re-infesting fleas within two hours and lasts up to a month. Advantage flea control kills fleas before they lay eggs and one treatment prevents further infestation for at least four weeks. Advantage is a once a month topical flea treatment for cats and kittens over 8 weeks or older and dogs and puppies 7 weeks or older. 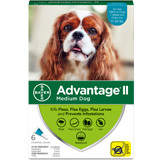 Advantage flea control is for external use on dogs 7 weeks or older and cats 8 weeks or older. 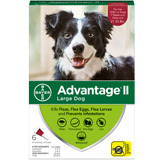 Consult a veterinarian before using on medicated animals, animals using this product with other pesticides, and debilitated, aged, pregnant or nursing animals. This product causes eye irritation in humans and is harmful if swallowed. Avoid contact with skin. Call poison control center if swallowed. If on skin, wash with plenty of soap and water. If in eyes, flush with plenty of water. Store in a cool dry place. Do not store in the refrigerator. To dispose wrap original container in several layers of newspaper and discard in trash. Keep out of reach of children and pets. 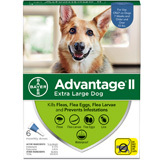 To purchase the right dosage of Advantage flea control you need to know the weight of your dog and the more packs you buy the more money you save.